Good Morning Everyone. I pray that all of you have a great Memorial Day. For anyone out there with family members who are in the armed services or who have lost a family member in the armed services, I would like to say a BIG THANK YOU. My family understands how hard this is on your families. We have a son who is a marine and has done two tours in Afghanistan. We are just waiting for him to get out of the marines and come home at this point. Hopefully that will be next Sunday, June 3rd. We await anxiously for the signed paperwork, so that we can go and get him and help him move. Again, I would like to thank every family out there for the sacrifices that you have made, I know that they are great. So for today's Bible Study. 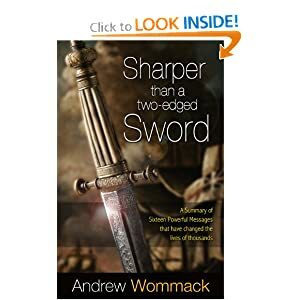 We have moved on to chapter 3 (Spirit, Soul, Body) in the book Sharper Then A Two Edged Sword by Andrew Wommack. I will post a picture of the book and the link to Amazon to be able to buy the book, in case you do not already have it. I love this scripture in 1 Thessalonians, and wanted to post it for you. I believe that it says so much to our hearts. and soul and body be preserved blameless unto coming of our Lord Jesus Christ. Question 1: Which part of me becomes new when I am born again? Because we can see our bodies, we know that the physical part of us does not change when we are born again. We can see that it is still the same as before we were born again. We also know what our soul is doing. We still have the same feelings and thoughts that we had before we became born again. If we are happy, we are still happy, that is something that we can feel, same with depression or irritability, those things have not changed. I believe from what the Bible tells me that my spirit is what becomes new. Jesus said, "God is a spirit; and they that worship him in the spirit and truth"
When we become born again your spirit becomes a new creation, a new creature. Scripture says that you become a new creature in the scripture below. old things are passed away, all things become new. The all things that become new can only be our spirit. Our bodies and souls still remain the same. Question 2: What happens in my spirit when I become born again? In 2 Corinthians 5:17 it says that you are a new creature, this is not your body or you soul. For your. For your emotions and personality traits to change you would have to renew your soul. It also does not say that you will become a new creature someday, it says that you will become a new creature now. The transformation of your spirit is complete and total and takes place immediately. Question 3: Is my spirit affected by the sin nature? I believe that our spirits are not affected by the sin nature. If our spirits are like Jesus, then your spirit would be righteous like the spirit of Jesus. in the day of Judgement; because as he is so are we in the world. There would be nothing of this world in our spirit, no negativity, depression, rebellion, fear, deception, or sin. Our spirit is pure. Question 4: If nothing can damage my born-again spirit, then why can't I just live however I want and not worry about it? Won't god still love me? God loves and relates to us in the spirit. We received holiness when we were born again and God loves us. God is not dealing with the sin of our flesh, he is dealing with our spirits, which is pure and holy. To sin at this point would be silly and stupid. It would be allowing Satan a stronghold in your life. Why would we want that for ourselves? I don't think we do. God would not turn away from us, but it is possible for us to turn away from God. Why would we want to invite Satan in to destroy us? We wouldn't, he has not good intentions for our lives. Though God and Jesus came into our lives so that we can have eternal life. Question 5: What does renewing my mind mean? For as he thinks in his heart, so is he "Eat and Drink"
says he to you, But his heart is not with you. This scripture means that it doesn't matter what your experience with God is. The way you think is the way your life will go. Until you change your thinking, your life will not change. The way you think is not instantly renewed or changed. The only way to do that is to read the Bible and know the word of God. Just reading the Word of God is not enough, you must know it and understand it. Things of this world will not renew your mind, only confuse it. Reading, meditating and understanding God's word is what will renew your mind. Question 6: You say I'm righteous as Jesus, but I can't believe that. It's not possible if my spirit was identical to Jesus, I'd know it! Wouldn't I? You can answer questions about your body and your soul. You know if your body is tired or in pain. You know what your body is feeling. You also know what your soul feels and thinks. You know if you are sad, depressed, or even happy. But the Bible says there are not just 2 parts to us after we are born again. Scripture tells us that there are 3 parts to us. Specifically in the scripture below. We are told specifically in the scripture above that we have a body, a soul, and a spirit. It is the spirit that we receive when we are born again. We do not necessarily feel our spirit when we are born again. This is something we have to work on. We need to know the word of God to know the spirit. Question 7: If I have the power and faith of Jesus in my spirit, then why do I need to bother renewing my mind? You do have the faith and power of Jesus, but you need to read the Word of God ( the Bible) in order to know the word, and you need to believe what it says. You need to meditate about it to know your spiritual identity. It's only the truth that sets you free. If your mind is focused on your body or soul you will not feel and experience God in your Spirit, but getting your mind in agreement with your spirit will open the full power of God to you. We need to renew our mind in God's word in order to come into agreement with God. Question 8: How is the word of God relevant to my daily life? If we do not know God's word, then we open ourselves to being deceived by false teachers and doctrine. How will we know what is true and what is not, if we have never bothered to learn God's word? It is a lamp to guide our feet and a light to help us find our path through life. The Bible is basically our instruction manual that God has given us on how to live our lives. God's word is how he speaks to most of us. It is through his word that we get to know him and how he wants us to live our lives on a daily basis. Question 9: How should I go about reading the bible? I believe that you should read the Bible systematically. You should start with the new testament, and learn about Jesus and the redemption that God gave us through Jesus. I believe that the first four gospels are really important for you to get to know Jesus, and then go from there. I always pray for wisdom, knowledge, understanding, and truth to be revealed before I start to read the Bible. I believe that this helps with all of the distractions that try to come in and stop you from receiving the fullness of the Word. I believe that you should meditate and understand what has been written in the New Testament before moving on to the Old Testament. I believe that we need to know both testaments of the Bible. We have lessons to learn from all of the Word of God. I think that reading the New Testament first will give a better perspective on the Old Testament. The Old Testament has the stories and the laws that God gave, but I believe that we need to know about our redemption through Jesus first, so that we understand that following the laws will not give us eternal life. Only belief in Jesus and what he did for us by dying on the cross will give us eternal life. This is the end of this weeks Bible Study. I hope that it is helpful to you. I would love to hear what you have to say, and what you would like to add. Please send me any comments or questions. I am never too busy to answer.